They have the coolest collection on vibrant eyeshadow colors. They carry Taylormade Minerals and made it available to the eager mineral make-up addicts of the Philippines. Since I've been pretty much daring in trying out colors, i decided to order their blues, greens and no surprise here, purples. :) Thanks to lovely Jheng for adding a freebie. As stated by Jheng, the e/s is already very vibrant even if its not foiled. :) I just love it! NATURAL LIGHT. applied dry with UDPP as base. Thanks to Jheng and Nica! 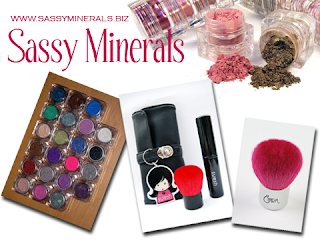 Sassy Minerals new fab fab site! click phot to be directed. Sassyminerals are currently on sale!